Drawing on our collection of historic records from the Portland JACL, this exhibit highlights the pivotal roles that women have played in the organization since its inception in the 1930s. Japanese American Citizens League, Portland Chapter Records, 1930-2008, the Library’s new collection, comprises the records of the Portland chapter of the Japanese American Citizens League from 1941 to 1994, with some materials as early as 1930 and as late as 2008. It encompasses the period leading up to the forced exclusion and internment of Japanese Americans during World War II and the re-establishment of the local community following the closure of the internment camps in 1945. 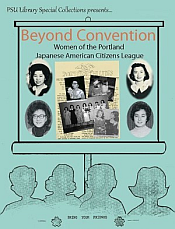 See our Online Finding Aid, and learn more on the Portland JACL Website. Many thanks to Marti Clemmons, Carolee Harrison, and the Oregon Cultural Trust for supporting this collection and exhibit.